I make a pretty decent cup of coffee. From what I remember, anyway — I haven’t made more than one or two cups at home in the past month. Instead, first thing every morning, I walk down the street to Caribou Coffee. The baristas are the first people I see every day, and they know my usual — a medium dark roast with room. I’m not getting anything fancy (at that hour, anyway), and although it’s a short hike from my place to Caribou, I literally cut through the parking lot of another coffee shop to get there. I recognize how crazy that sounds. So what keeps me going back to Caribou day after day? At the top, the cup reads: "Trivia nights with friends, Rachel P." You are in the presence of coffee royalty. Also this smoothie tasted better than it photographed. Adding to my general addiction to coffee, Caribou does a great job with marketing. Their slogan is catchy: “Life is short. Stay awake for it.” Their Facebook and Twitter accounts keep me up to date on sales and events. The website, like the store itself, includes a trivia section and a section for suggestions. And the new frequency cards were call-the-family newsworthy. If I sound like a poster child for Caribou Coffee, it’s only because I am. 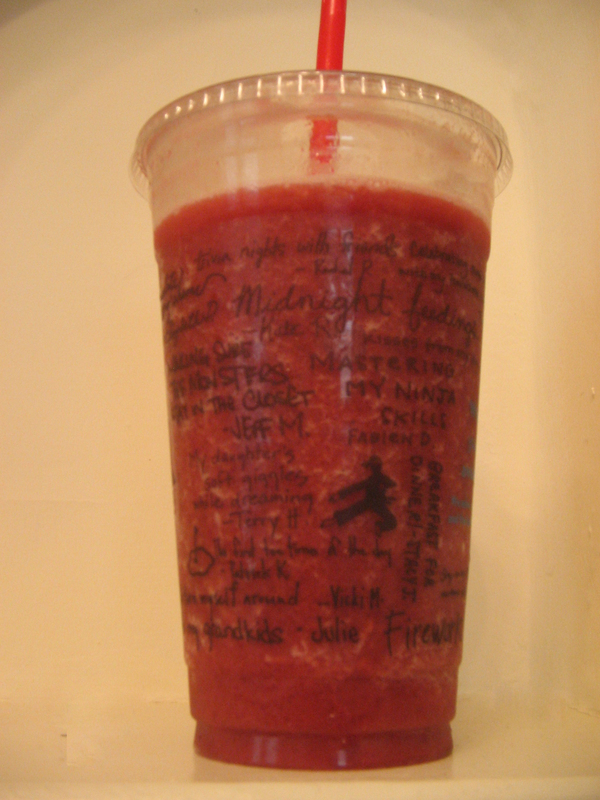 A few months ago, Caribou started a “What do you stay awake for?” campaign, and my submission is featured on the large cold cups. The day I got an email saying my name would appear on “millions of cups” was one of the best of my life, at least until the frequency cards arrived. Do I just love the product so much I couldn’t help but participate in their marketing campaign? Or is their marketing campaign so good, I just couldn’t help but want to participate? I honestly think it’s a little of both. I don’t mind hitting the “like” button for a product I actually love, and I don’t mind a daily bit of marketing if it comes with a bit of fun. And a bit of caffeine. Let me add an “Amen” from another Caribou devotee. I love your wittiness. I also wish I had a Caribou Coffee near me…poster child, get to work on that.